You may know this button: There is no native Powershell command to grant OAuth permissions to an Azure AD Application, so I wrote a function for that. Note that this is NOT a supported way to grant permissions to an application because it does not follow the proper admin consent flow that applications normally use. 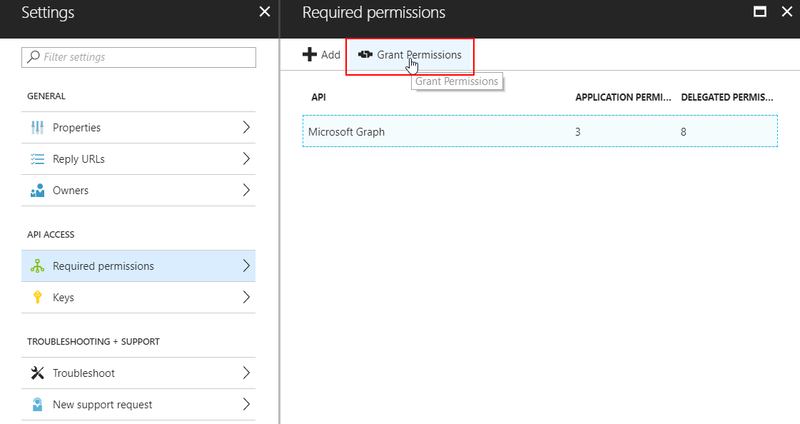 The great advantage of my method is that it can be used to grant permissions silently, AND to ‘hidden’ and/or multi-tenant applications that companies like Microsoft use for backend stuff like the Intune API. (e.g. the ‘Microsoft Intune Powershell’ multi-tenant application). The function requires AzureAD and AzureRM modules installed! A few weeks ago I posted a script that would automatically, periodically, reconnect to Exchange Online. In field testing it would still prompt for credentials after 1-2 days, whatever I did. disclaimer: don’t overwrite $o365Creds with invalid creds elsewhere in your script as those are used globally. One of my customers is doing a full cloud-only pilot of Windows 10, Mobile (MDM) managed through Intune to leverage a least-infrastructure solution worldwide. They’re using Azure AD, but opted out of Onedrive for Business and are using Box Drive instead. To encourage their users to actually save data to Box instead of Onedrive or locally, I wrote a little Powershell script (since Intune native PS script deployment isn’t live yet). This script checks if Box has been configured, if not it throws a little popup to the user. If it has, it redirects My Documents, and copies any existing content from it to Box. So, an example use case could be my OnedriveMapper MSI file, which is installed with a configuration GUID property by an admin to customize OnedriveMapper. If that GUID was already in the MSI, no such parameter would be necessary. Using an Azure function in a download link or http request, we could insert a GUID on the fly and create personalized MSI files on demand. I’ll leave other applications to your imagination, let’s get started! Natively, when connected to Office 365, Okta allows you to automatically provision users and/or groups. Additionally, Okta will assign licenses you select, and if configured, set predefined roles in Office 365. This means you have one locus of control, very nice. Then, Exchange Online allows you to define custom roles where you can scope permissions for your users with far greater granularity compared to the default roles, Okta won’t detect or provision users into these custom roles. As this was a business requirement for a customer, I coded up a small proof of concept you can schedule that will read membership of selected groups in Okta through the Okta API, then ensure that ONLY those members are in the matching role groups in Exchange Online. Okta exposes a very useful API, with which I’ve been working for a while to ensure business fit for certain scenario’s that Okta and/or Office 365/Azure don’t fully support yet. One of those scenario’s requires information about certain groups and their members. I’m narrowing the selection down to just pure Okta groups, but any groups (e.g. AD Synced) can be returned with below code by adjusting the filter in the retrieveAllOktaGroups function. First, you will need an Okta token to use with Powershell’s REST functions, this is the easiest part. I recently ran into an article by Pieter Wigleven, based on an original idea of Jan Van Meirvenne that I simply have to share, and expand upon. When you go cloud first, and do light MDM management of your Azure AD Joined Windows 10 devices, you will likely enable a Bitlocker policy in Intune. What you’ll quickly discover, is that your policy will not automatically enforce/enable Bitlocker on non-InstantGo capable devices. So, I expanded upon Jan and Pieter’s script to automatically enable Bitlocker on Windows 10; it has additional error handling, local logging and it will eject removable drives prior to immediately (vs reboot) encrypting your system drive. After this is started, it will register your recovery key in AzureAD. Of course all credit for the original idea goes to Jan van Meirvenne.